When you are satisfied with your schematic design and simulation results, you can then quickly proceed to produce your finished and populated PCB without leaving EasyEDA. EasyEDA’s PCB Design canvas helps you to quickly and easily lay out even complex multilayer designs from schematics you have already created in the Schematic canvas or directly as a layout with no schematic. 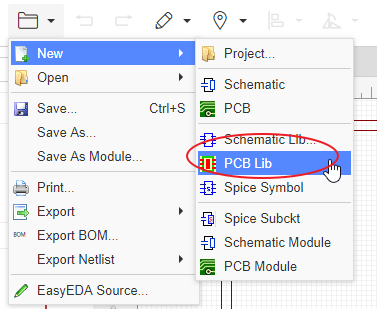 Passing an EasyEDA Schematic into the PCB Design editor is as easy as clicking a button: Just click the Convert to PCB PCB icon on the top toolbar! EasyEDA has extensive libraries of footprints. You can also build up your own library of unusual and specialized parts by copying and modifying existing parts or from scratch using EasyEDA’s powerful footprint creation and editing tools. In a similar way as in the Schematic design canvas, to help you locate items and navigate your way around when working in the PCB Design canvas there is a PCB Design Manager. The PCB Design Manager is a very powerful tool for finding components, tracks (nets) and pads (Net Pads). Clicking on any item highlights the component and pans it to the center of the window. The active layer and layer visibility can be selected using the Layers Toolbar. From first setting up the Design Rule Check (DRC) at the start of your board layout, running a DRC is almost the last step in checking your PCB design before you generate Gerber and Drill files for board manufacture ready to place your order for a finished PCB. And you can produce professional quality SVG, .png or .pdf output files for your documentation. PCB Designs can be shared with colleagues and made public in the same way as Schematics. The size of PCB that you can produce using EasyEDA is almost unlimited: designs of over 100cm * 100cm are possible … but you might need a powerful computer for that. EasyEDA supports up to 6 layer PCBs by default but it is capable of handling more, so if you need more layers then please contact us. Searching footprints is the same as searching symbols by using Libraries in the Schematic. You can place the selected footprints in the canvas after the search.